Last week two very interesting questions were blown up on a digital billboard at one of America's most monumental places: Times Square. It is one of the busiest area's and has more than 300,000 pedestrians passing through each day. 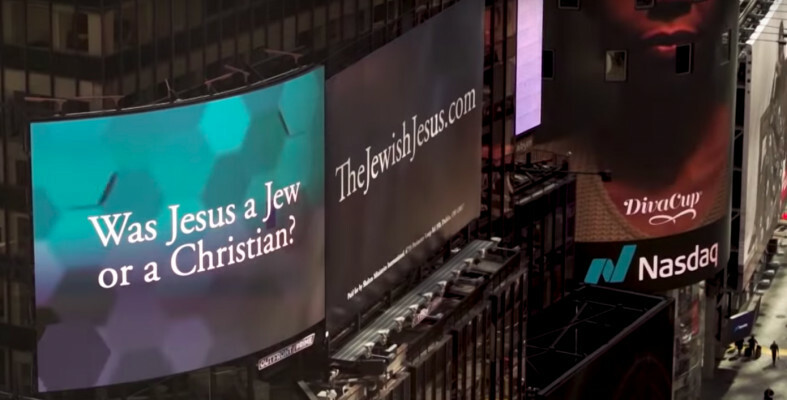 Charisma Magazine reports that the big billboard states: "Was Jesus a Jew or a Christian?" and "Did Jesus Come to Start a New Religion?" Messianic Evangelist Rabbi Kirt A. Schneider, the host of the international broadcast Discovering the Jewish Jesus, wanted to announce via the digital billboard a seven-part online docuseries that will challenge viewers' preconceived beliefs about religion and Jesus. TheJewishJesus.com billboard is featured alongside other significant organizations and is located beside the Nasdaq. "Jesus came as a Jew, lived as a Jew, and died as a Jew. He still is a Jew and is the Savior of Israel and the salvation of the world," explains Schneider in a video announcing the digital display. The Rabbi hopes and prays that readers and listeners will draw closer to Jesus by discovering the truth for themselves. He believes that if you know the history of Christianity and Judaism properly, it is easier to share the gospel with Jewish people and appreciate the Hebrew culture at the same time.